Sixteen year old Kali Gorzell of greater San Antonio Texas was boating near Aransas Pass about 10:30am Friday July 20, 2012. 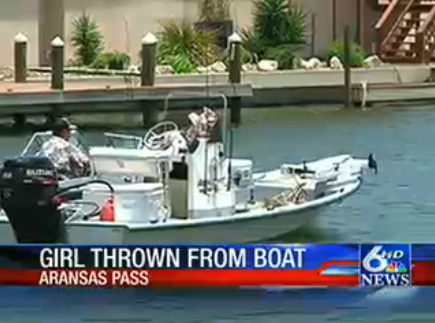 The teenage girl was onboard a boat as a friend of two sisters and their father. They were boating on Redfish Bay, near Dagger Island. The boat turned, she fell over the front, the boat passed over her, and Kali was struck by the propeller. The same boat brought her to Hampton’s Landing off East Ransom Road. Witnesses said she was bleeding badly from a deep gash beginning at her neck and running up her head. She was taken to Care Regional Center in Aransas Pass, and pronounced dead from lacerations to her face and the back of her head. Kali Gorzell propeller accident boat. Still image from KRISTV news video. The boat involved looks like a white center console powered by a Suzuki outboard in this still image captured from a KRISTV news report. 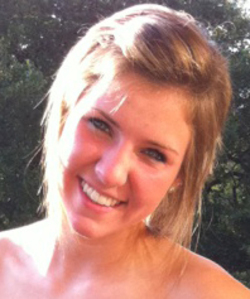 Kali Gorzell was a sophomore at Smithson Valley High School in Comal ISD. Her classmates and friends describe her as full of zest for life and recall how she was always a positive influence on those around her. 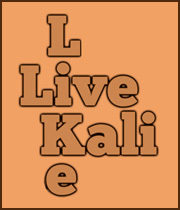 Students there are now using the phrase, “Live Like Kali”, to encourage others to life life to the fullest as she did. Kali is described as a popular girl and a member of the volleyball team. Her older brother recently graduated from the same High School. Kali cheered him on in in several golf tournaments. A wonderful tribute to Kali Gorzell has been posted on YouTube. You can get a sense of the love she exhibited to others from comment by teens in this Fox News video. Kali’s full name is Kali Eyvonne Gorzell. The investigation is ongoing by Police and the Texas Parks and Wildlife Marine Department, but early reports indicate something may have cause the boat to jerk which resulted in Kali being ejected. A rosary will be recited at 6pm Wednesday July 26 at St. Mark’s Evangelist Church in San Antonio. Funeral services will be 11am Thursday July 27 at Community Bible Church in San Antonio. Interestingly, the Pastor at Community Baptist notes, another service will be held there this week for Jessica Ghawi, the young woman killed in the Batman movie theater shooting in Colorado that was budding sports reporter. Jessica Ghawi used the name Jessica Redfield in her sportscasting career. Both girls (Kali and Jessica) also attended Smithson Valley High School and died on the same day. Kali was an active member of the Church’s Youth Group. Our coverage above is strongly based on local news coverage by Caller, Kiiitv, KRISTV, WOAI, KSAT, and others. We thank these local news outlets for covering this propeller accident. At approximately the same time as this accident, a teenage boy was somewhat similarly fatally injured in the UK. See our coverage of the Charlie Hutton accident. That accident is receiving national press in the UK. Kali Gorzell was well know for telling her mother she loved her when she called and for ending her text messages with the less than 3 symbols (text symbol for a heart. 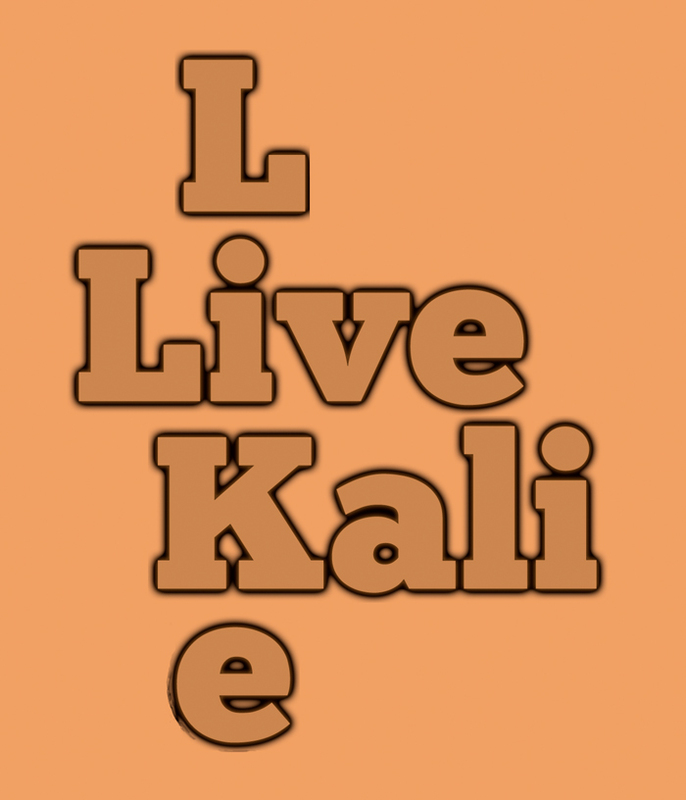 Her friends and classmates created the “Live Like Kali” slogan to encourage others to similarly live life to the fullest while inspiring and uplifting those around them. Several examples of the slogan use hearts at dots above the i’s. Others just use LLK. We have considerable experience at creating text art, but usually work with much more text than just a slogan or motto. We created a few variations, but are quick to admit they pale in comparison to some of those created impromptu by Kali Gorzell’s fellow students and friends. The image above was inspired by some photos of Kali in cowboys boots and with a horse. Some version of the general theme above might be made into a attendance stamp for those attending local sporting events or even a locally used postage stamp. The image above combines one of the photos of Kali with a horse from the tribute video with the stamp theme. During her funeral at the Community Baptist Church, a photo of Kali Gorzell smiling displaying a small fish she caught about 20 minutes before the accident was in the lobby. She had texted the photo to her parents before the accident. Hundreds of mourners came by to hug her parents and to offer them a few words. We also created an interactive map of several sites relevant to the accident and the life of Kali Gorzell. In March 2013, the Texas State Legislature introduced a bill to honor the life of Kali Gorzell. In May 2013 the U.S. Coast Guard released their 2012 Boating Accident Report Database (BARD) data. This accident (2012-TX-0148) is listed as occurring in an 18 foot Rockport boat built in 2009 powered by a 90 horsepower Suzuki outboard.